Eric is a member of the firm’s Workers Compensation Practice Group. Eric grew up in Lincoln, attended Lincoln Southwest High School and graduated from the Leysin American School in Leysin, Switzerland. He studied at Kenyon College in Gambier, Ohio where he majored in history, played in the jazz ensemble, and joined the Alpha Delta Phi fraternity. After college, he served as an intern in United States Senator Ben Nelson’s Washington, D.C. office and then worked as an aide to State Senator Burke Harr in the Nebraska Legislature. Eric received his law degree from William and Mary Law School in Williamsburg, Virginia. 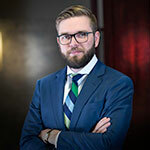 During law school, Eric served as a summer intern for the United States Attorneys’ Office for the District of Nebraska and a summer legal intern for the International Institute for Democracy and Electoral Assistance in The Hague, Netherlands. Eric was also a member of William & Mary’s National Moot Court Team, the William & Mary Environmental Law and Policy Review, and was elected to the Order of Barristers. Before joining Baylor Evnen, Eric served as a term law clerk for Judge Riko Bishop of the Nebraska Court of Appeals. Eric enjoys playing ice hockey, hunting, and Nebraska football.